Around a week ago, I posted a news piece about an upcoming space arena combat RPG game called Ring Runner – Flight of the Sages. Shortly after that post, I contacted the folks at Triple B Titles for more information. After a pleasant email exchange with Enrique Dryere — one of the creators of the game — I asked if I could do a Q&A with him about this interesting looking game. After the cut, you can read the Q&A with Enrique, as well as see a new video of one of the game’s archetypes. Enjoy! Brian: Could you please tell us the inspiration and origins of Ring Runner, such as where you got the idea and how it all came together into the game you’re about to release? If I were to guess, one of the influences would be the classic game Subspace. Enrique: You’re right to point out the similarities between Ring Runner and Subspace; however, it’s initial inspiration actually comes from an old game by Mythic Entertainment called Silent Death Online, which was based on Iron Crown Entertainment’s miniatures space battle game. I must’ve been around 12 years old or so when I played that game. It cost something like 2 bucks an hour to play, and I racked up around a 2000 dollar bill in just a month. Naturally, I was grounded for a good while and never allowed to play again. Ever since, I’ve wanted to recreate some of the fun I had with that game. I’m an all inclusive gamer. I can enjoy nearly any kind of genre, but my favorites are RPGs and action games. Shortly after my experience with Silent Death, I was captivated by Diablo, then Diablo 2. I played WoW since beta. I was also a big fan of Guild Wars and MOBA games — most recently League of Legends. I think you will see that all of these influences filter into our game, but Ring Runner is unlike any one of those games. You’ll also find that the “space shooter” elements of the game are in no way diluted by the inclusion of RPG elements. If I had to define the game, I would say that it’s either an intense modernization of Silent Death — and perhaps also Subspace — or a “space-ification” of Diablo with MOBA-like multiplayer built in. Brian: Could you give us some more information about each of the archetypes in the game, and what their strengths and weaknesses are? Enrique: There are five archetypes: Grapplers, Rogues, Casters, Arsenals, and Fighters. The first three present more direct analogs to RPG classes. Grapplers are like warriors. Rogues are, of course, like rogues. And Casters are like mages or wizards. The Arsenals and Fighters will offer more traditional space-shooter gameplay, with Arsenals relying on turrets, overwhelming firepower, and reactive defensive abilities, while Fighters rely on agility, superior pool management, and precise lasers. Grapplers’ greatest strength is their ability to grab, pull, and throw opponents and space debris. This makes them excellent interceptors. Their melee weaponry is lethal up close, but they lack in long range offensive power. They make up for this with a good degree of mobility and durability. Rogues are sneaky; I mean really sneaky! Even completely out of stealth, they can be very elusive. Their wide array of decoy abilities is what makes this class so special. And they’re not short on firepower either. They can cripple opponents and sabotage base structures with their combo-based gemini weaponry. But a rogue will need to make full use of his decoy abilities if he wants to keep up with the other archetypes in terms of mobility and durability. Casters are a well-balanced class. They have good mobility and decent durability. Most of their offensive capacities are area of effect, which makes them excellent in group combat, while reducing the need for precise aim in one-on-one dogfights. What sets Casters apart are all the tricks they have up their sleeves. Particularly their control over time and gravity can grant them an edge against any opponent. Like most balanced classes, their weakness lies in the balance itself. They’re not the worst in any aspect, but only their trickery is peerless. Arsenals, as their name implies, pack a lot of firepower. In terms of raw damage output, they are second to none. Where their closest rivals, the Casters may summon comets or solar flares, Arsenals prefer more conventional approaches, like swarms of rockets, cruiser strikes, and the ever-feared spinning-laser-beams-of-doom. Arsenals are also turret masters, and there’s a lot more to turrets than just dropping them off in a defensive location. You can tether them along, they can gain “ranks,” you can pool your shields with them, swaps positions with one, and customize them with a variety of passive skills. In terms of mobility, Arsenals are quite limited. They rely on reactive defensive abilities and robust shielding for their survival. They can blast projectiles out of the stars with their laser defense system, they can angle their shields, or deploy laser walls to block incoming attacks. If piloted correctly, an Arsenal’s durability is comparable to a Grappler’s. Fighters are what come to mind first when imagining a space shooter. They’re agile, pulling off barrel rolls, teleporting short distances, and achieving great speed. Their fixed-cannon lasers are extremely powerful, but require a high degree of precision. The biggest twist that our version of superiority fighters bring to the genre is their ability to manipulate the energy and heat pools. Whereas other ships may try to keep their heat as low as possible to prevent overheating or losing stealth capacity, Fighters will often want to run hot. They can consume heat to unleash powerful beams, leave trails of plasma through space, and create explosions that will overheat (stun) opponents. Fighters have the lowest durability in the game, but that’s only a weakness if you get hit. Brian: Please tell us about the various skills that each of the archetypes can use? Which ones are your favorites? How does your character advance in their skills? Enrique: Since there are over 300 skills in the game, it’s hard for me to pick out just a few. We’ve tried very hard not to create an imbalance, in which a few skills are just clearly superior to another. So far, I think we’ve been fairly successful, but we have many more months of balancing to go. I’ll just pick out one for each of the archetypes. For Casters, I’m very fond of the passive ability: Critical Time Loop. When you’ve been dealt damage that would’ve otherwise killed you, you’re instead returned to whatever state (location and condition) you were in three seconds ago. If you were swarmed and killed all at once, this means you’ll practically be full health. Of course, this ability can only be triggered every so often. For Grapplers, I love the Cargo Loader, which allows you to actually hold opponents for a few seconds before tossing them away. This ability is particularly fun in an asteroid or trash field. It turns your environment into a weapon. While the opponent is held, damage dealt to them is reduced, but they’re unable to act. You can still lash into them with your mining lasers before slamming them against a wall. Maybe it’s because I’m such a Trekkie, but for Arsenals, I love using the photon torpedo volley, which fires three photon torpedoes in quick succession. They’re devastating against hulls, and I actually created their sound effect with a Slinky! A Rogue’s Holoport ability lets them teleport to the location of the nearest decoy. There’s so many wonderfully tricky ways to use this ability, I just love it. It pairs well with the ability to detonate your decoys. Opponents just don’t know what to do with you! There’s no greater feeling than barrel rolling out of the way of a swarm of oncoming missiles. Fighters are just fun to fly. Drawing a circle in plasma around an opponent can be lots of fun too — this is what a cunning pilot can do with the Plasma Exhaust Device, which vents your heat as you fly, leaving a trail of piping-hot plasma in your wake. As far as advancement is concerned, you don’t actually gain “levels.” Your character only becomes more powerful through the acquisition of Sage abilities, which, for instance, include slowing down time. These abilities are not hull-specific. Rather they are equipped into the “Corona” in your head. There are 5 Ranks of hulls. Progression through these ranks happens in a matter of hours during our single player campaign, and it is practically the only “vertical” improvement in our game. That is to say, a rank 2 is better than a rank 1 in every way, as a rank 3 is better than a rank 2, and so on. Once you reach rank 5, the game’s focus becomes “horizontal” improvement. New hulls and equipment will offer new gameplay. They may be better suited for specific situations, but they’re not going to be better across the board. In fact, none of the 300+ abilities are made obsolete at any point. Brian: I’ve read there are around sixty five ships in the game, and that these can be used by any archetype, rather than being role specific. Could you clarify how this works, and give us more information about what kind of ships we’ll see in the game? Twenty of those ships are ranks 1-4. You will likely only fly these during the single player campaign. After that, they will serve mostly as easier opponents in wave and exploration modes. Of the remaining forty-five rank 5 hulls, five are duos, designed for local coop, and five more are “pure” archetypes. That means they only contain generic nodes and the three node types that are unique to their archetype. All of the rest of the hulls are hybrids, mixing, for instance, two node types from one archetype with a third from another. You can think of these rank 5 hulls as templates for “speccing” or customization that have a preset amount of node slots, which are equivalent to points that you could attribute to a specific “talent tree” in other games. Brian: It looks like you can severely customize your ship as well. Could you give us more details as to how ship customization works, and what kinds of equipment the player will have available to them? Enrique: Every aspect of your ship is customizable. I compared ships to speccing templates; you can also compare them to a new character with unique equipment slots. For instance, maybe there’s a fashionable elf in some game that can wear five vests, but only one set of pants; whereas a rugged dwarf stuffs himself into four sets of pants, but refuses to wear a vest. Only in this game, nearly every piece of equipment you “wear” has a skill attached, whether it be passive or active. There are two approaches you can take when it comes to equipping engines, power cores, auxiliary drives, heatsinks, and shielding. You can choose a piece of gear that will almost max out the amount of nodes — these will usually come prepackaged with an ability. Or you can go with a single-slot, basic core, engine, shield, etc, and customize them with modules and abilities, each occupying additional slots. As you equip new abilities, you’re given the chance to bind them to nearly any button you choose. There’s even a modifier button (currently the left shoulder button on the XBox controller) to accommodate pilots who prefer a wide array of active abilities; although launching with just four actives and a bunch of passives will certainly be a viable strategy. The right stick is reserved for your “Archetype Ability.” You can only equip one of these at a time. The direction in which you flick the right stick will modify this ability in some way, usually directionally. For instance, the Evasive drive lets you do a barrel roll in the direction in which you’ve tapped the stick. Pressing down on the right stick will activate your Sage ability. The right shoulder button is your afterburner and the two triggers are thrust and brakes. The left stick is used to actually control your ship. Start brings up the menu and a list of your bindings. The “Back” button brings up your map. The rest of the buttons, including the D-Pad, are all bindable. Brian: Could you give us the rundown of the single player mode? Will it just be skirmishing or will there be a campaign? If so, will it have randomly generated areas such as Diablo and Din’s Curse, or will it be more linear like Titan’s Quest? Are there other modes besides straight up combat you can tell us about? Enrique: The actual plot flow of our single-player campaign is linear, but it does contain a high degree of procedural elements, beginning with backdrops and level layouts, and culminating in the enemies themselves. The AI is modular, meaning it can equip any variety of weapons and abilities and still use them coherently. Every encounter is unique. We’re actually in the process of roping this in at the beginning of our campaign because we don’t want to overwhelm new players with a sudden burst of so many wildly varied skills. Imagine you just started playing the game and some enemy is hitting you with a growth ray; a comet streaks by, while the image of another ship keeps appearing and disappearing behind you; meanwhile another ship keeps tossing you around like a ragdoll, and something like sniper rounds keep whizzing by. Of course, this is an exaggeration, but we want to make sure that new gamers are not put off by a potential torrent of new skills and hull types coming at them all at once. 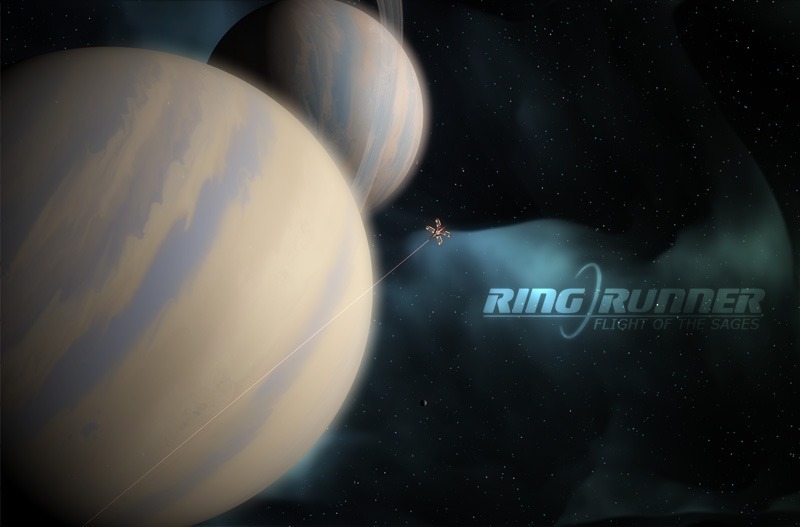 The single player campaign is designed to be a gradual introduction into the universe of Ring Runner. It’s strongly story driven and told in a humorous tone. Players will find themselves embroiled in a battle between trash clans (no not trash cans, trash cLans) at the beginning of their adventures. They’ll be visited by a mysterious Sage who teaches them how to restore The Way to The Will. This is done in the Subrostrum, a subatomic playground full of colorful particles and quantum forces. Each Sage ability will be gained by overcoming a challenge in the Subrostrum. Most of these missions will play like mini-games, recognizable as arcade classics like brickout, cannon games, missile defense, pong, and even world of goo-like challenges. All the while, the player is led by perhaps their only friend in the universe, the voice inside their head: Nero the Neuro-Hud. The single-player campaign will take players through a wide variety of missions. There will be classic dog fights, cruiser battles, base battles, and the like. But there will also be gladiatorial games, turret defense, stealth missions, and a fully developed racing mode! Brian: What can you tell us about multiplayer functionality, such as game modes, server sizes and the like? What can you also tell us about the “duos” two-player co-op ships? Enrique: There may be an initial desire to see epic forty-on-forty space battles, but in reality that would only result in a unplayable cacophony of explosions and lasers. We’ve decided to settle for a four-on-four model in our base battles. The game is peer-to-peer to provide the fastest connections possible. Fans of Silent Death Online might remember that you had to “lag shoot” in order to hit someone in that game. We’ve taken every step possible to ensure the smoothest, highest fidelity in our multiplayer experience. Our net code uses a sort of mini-cloud structure. Players connected to one another share processing responsibilities for all of the entities involved. There is a host, however, host migration will occur with minimal interruption. If a player joins mid-game, an AI is removed. Should that player drop, the AI will immediately begin piloting his or her ship, and the other players may not even realize that they’re gone! If you were to lose internet connection during a game, all entities migrate back to you for your own version of the game. The match continues with the AI piloting all other entities. We’ve taken these measures to ensure that multiplayer gameplay, whether coop or versus, will be as stable and reliable as possible. You can instantly launch into a game without waiting, and friends can join you mid battle or vice versa. There are five duos, each representing a “pure” archetype. The first player pilots and the second player controls a rotating turret. Aside from archetype and Sage abilities, an ability equipped by the duo can be bound to either the first or second player. Duos will be able to launch into nearly any kind of game mode other than the single player campaign and the subrostrum. Brian: Could you give us some detail on the kind of control scheme we’ll have to work with and the types of environments we’ll have to fly in? The game looks like it uses some sort of Newtonian physics model, rather than simple turn and burn. Enrique: The movement is Newtonian. The right stick is used to aim certain Archetype Abilities. As described above, Archetype Abilities are triggered and modified by the right stick. I think I answered most of this question in my response to your customization question, so I won’t bore you by reiterating. I will only say that we chose Newtonian over twin-stick because we believe it fits better with all of the physics-altering abilities in the game. It may be a bit more challenging for some people, but in the end, the combination of this control style with our many movement abilities results in a great deal of fun possibilities. Brian: Please give us some details on the engine you’re using, such as how many ships it can handle on screen at once, what kind of effects we can expect, and so on. Enrique: The “Runner Engine” was developed from scratch in XNA. Of course, like any other engine, its capacities depend on which hardware it’s being run. On the XBox we can potentially have around 40 ships on screen; though as I mentioned before, we’ll typically refrain from large swarms for gameplay reasons. Our particle system can support around 20,000 active particles. And we have all the post processing effects you’d expect in modern engines, such as bloom, Gaussian and radial blurs, color grading, and distortion. The engine is also able to procedurally generate complex nebula and planet backgrounds in just seconds. There are billions of potential backgrounds. Brian: Finally, what is the one thing you’re most excited about with Ring Runner, and how would you explain that one thing to potential fans? Enrique: Depth! If you like rich, challenging gameplay, if you like games that you can play for hundreds of hours, Ring Runner is for you. And no, we’re not going to be charging 40 bucks plus for this thing. We’re going to make it as affordable as we can! It’s an indie project, made from scratch by two brothers over nearly a five-year stretch. And it is our love letter to video games. We want as many people to enjoy it as possible. There will also be a Ring Runner novel released alongside the game. Thanks to Enrique for his exceptionally detailed answers. :) Now, as promised, here’s that video. Enjoy! Thanks for the interview, Brian! If your readers have any more questions for us, we encourage them to come try out our brand-new forums at http://www.ringrunner.net!